Refugees are welcome here. We’ve seen and heard this across Canada – chants, signs and tweets sharing this message – including from our own prime minister, Justin Trudeau. We’ve also seen many examples of how civil society actors have formed interconnected networks in response to the plight of refugees around the world and have successfully influenced public policy. While protection gaps remain unaddressed, community voices are getting louder, and the current government has shown they are willing to listen. At a time when refugees are undertaking increasingly desperate and dangerous journeys to reach safety, it is important to look at how ordinary members of society advocate for and implement mechanisms of safe passage, and build on these actions. Thanks to the collective influence of communities across Canada, private sponsorship has evolved into a unique and defining element of our immigration system. In the early 1970s, faith-based organisations and settled immigrant groups successfully lobbied the government to allow them to sponsor and resettle thousands of refugees in addition to the government’s commitments. As a result, the government established a legislative provision permitting individuals, small groups and companies to name individuals they want to bring to Canada. For an application to succeed, sponsors must promise to support refugees socially, emotionally and economically for one year upon arrival. Today, thanks to the collective influence of communities across Canada, private sponsorship has evolved into a unique and defining element of our immigration system. In 2015, disturbing images of the violence in Syria and a photo of the lifeless body of 3-year-old Alan Kurdi – an unjustifiable consequence of the lack of safe passage – resonated with Canadians. They shifted the public discourse, revitalising Canada’s humanitarian values and our multicultural national ethos. This was particularly visible at the local level. Ordinary Canadians, with and without a personal connection to refugees, demanded government action to resettle Syrians through the ‘group of five’ private sponsorship model. The federal government responded by reinvigorating private sponsorship, blended-visa, and government-sponsored resettlement programmes in Canada. A total of 40,081 Syrians have been resettled through these resettlement programmes. Of that number, 18,205 (or 45% of the total) arrived with the help and generosity of local communities. Private sponsorship isn’t perfect. The unprecedented public demand to offer safe passage to Syrian refugees resulted in processing backlogs and in the government imposing restrictive caps on Syrian sponsorship applications for 2017. Furthermore, privately sponsored refugees from other regions still remain in limbo for years before arriving in Canada. Formally-established channels of safe passage also exclude certain populations of asylum-seekers, prompting many to turn to more dangerous means of travel. Smuggling, for example, is a precarious, people-powered migration apparatus that refugees turn to in order to reach a safer country because legal pathways are unavailable to them. The Supreme Court of Canada confirmed that context matters, ruling in R v. Appulonappa that not all smuggling should be criminalised. But, smugglers may be refugees themselves, assisting their family to seek asylum. Smugglers can also be well-intentioned aid workers like Janet Hinshaw-Thomas, who facilitated the irregular entry of Haitian refugees into Canada from the US so that they could seek asylum. ‘Humanitarian’ smuggling is not a safe passage for refugees – but it reveals the willingness of some individuals to put themselves at considerable risk in order to forge a path to safety. The Supreme Court of Canada confirmed that such context matters in 2015, ruling in R v. Appulonappa that not all smuggling should be criminalised. Communities situated near the US-Canada border have also been responding to the increasing number of asylum seekers crossing into Canada from the United States, out of fear of the Trump administration. Such responses demonstrate the capacity of civil society to respond to refugees in need, especially when government action is lagging behind. Many residents provided a warm drink, shelter and a friendly face for refugees, many of whom had walked hours through snow and extremely cold temperatures in order to get there. In this context, local officials have also become de facto border patrols, monitoring fields and roads, willing to help ensure the refugees’ safety. There have also be reports of taxi drivers south of the border, concerned service providers, migrants, and citizens in both countries organically contributing to a new, discrete “underground railroad” of information and resource sharing. This network isn’t trying to promote irregular travel; they’re helping educate people about the risks, and trying to minimise them. 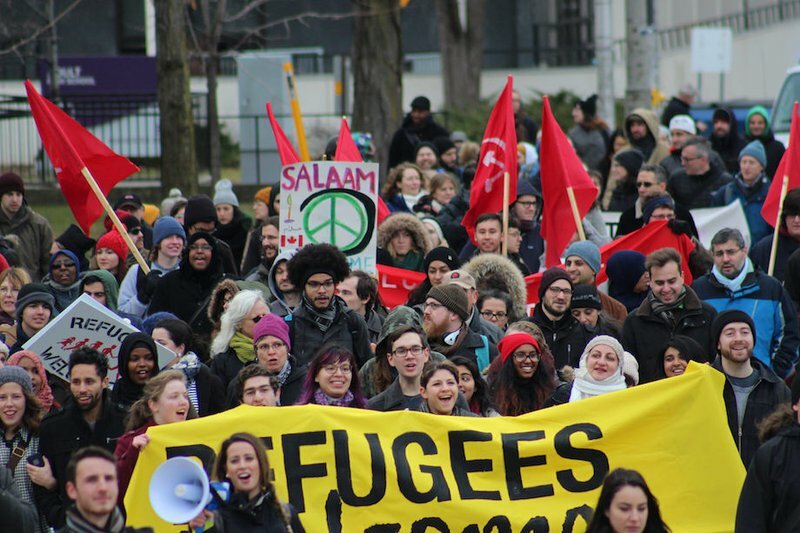 Most recently, there has been a grassroots initiative by law students in Manitoba, who organised to provide assistance to asylum seekers filling out the necessary paperwork and developing refugees’ narratives for their asylum claims. However, some Canadians want tougher controls. With more than 350 claimants having arrived in Manitoba in 2017, border communities are becoming increasingly frustrated and concerned about their own safety. Migration isn’t slowing down and refugees fearing persecution will continue to go to great lengths to seek safety. In 2017, we need creative, sustainable ways of establishing safe passages for refugees, in Canada and elsewhere. One place to start is acknowledging the power of the people.